Our deepest obligations to each other are being defined as criminal by the privatization of natural phenomenon. 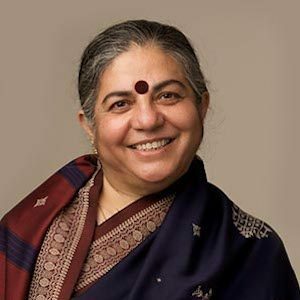 In her lecture Vandana Shiva questions how a seed can be commoditized when it carries in it the history of the earth, its seasons, and the farmers who worked the earth. How can it be patented by corporations? The seed, she argues, is rightly part of a common cultural inheritance; it does not belong in the economic sphere. In challenging the commercialization of the seed, she challenges the growing global economic system and the corporations that feed it. It is a struggle for the preservation of cultural identity, diversity, and small communities. Shiva speaks passionately about the effects of industrial agriculture on small farmers, the environment, and the quality of the foods we eat.